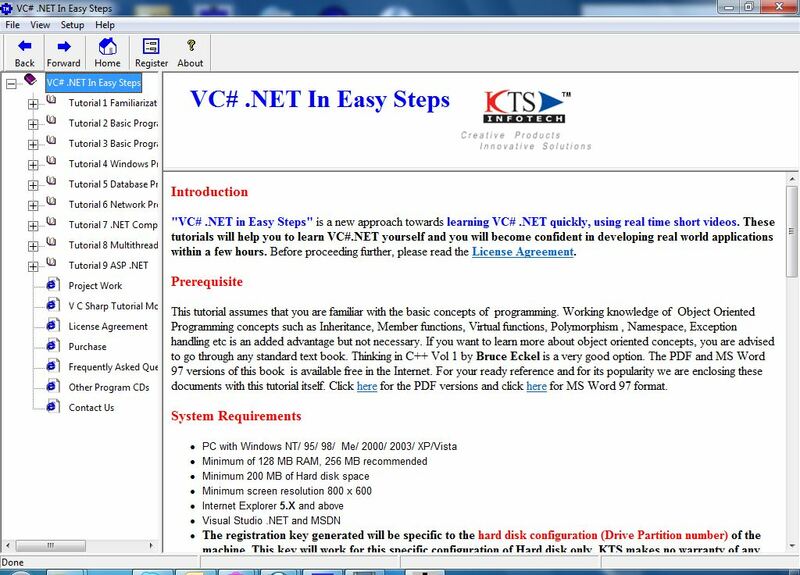 "VC#.NET In Easy Steps" is a set of C#.NET Tutorials which helps you to learn C# quickly, using real time short videos. Using these Tutorials anybody who has knowledge in basic object oriented concepts can easily master C#. For more details click here. In the Evaluation version, all the contents except Tutorial videos can be accessible. Registering the product enables viewing of the videos in the package. Cost of the software is 10 USD. Purchase the software from the appropriate link below. This C#.NET tutorials assumes that you are familiar with the basic concepts of programming. Working knowledge of Object Oriented Programming concepts such as Inheritance, Member functions, Virtual functions, Polymorphism , Namespace, Exception handling etc is an added advantage but not necessary.